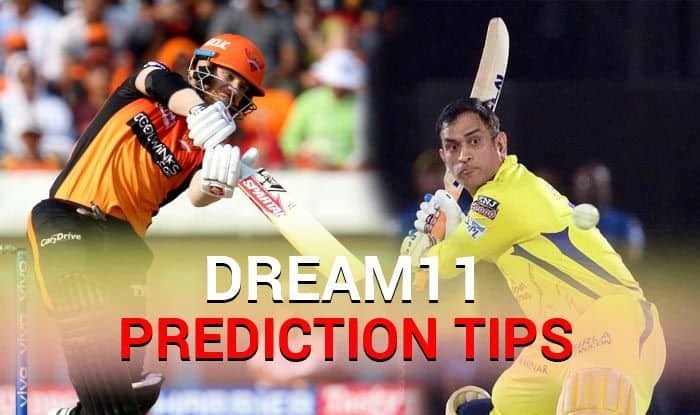 SRH vs CSK Dream11 Team - Check My Dream11 Team, Best players list of today's match, Hyderabad vs Chennai Dream11 Team Player List, SRH Dream 11 Team Player List, CSK Dream11 Team Player List, Dream11 Guru Tips, Online Cricket Tips IPL 2019. Dream XI Team SRH vs CSK IPL 2019 – Cricket Predictions Tips For Todays IPL Match Hyderabad vs Chennai at Rajiv Gandhi International Stadium, Hyderabad: Having missed the World Cup bus, Ambati Rayudu will be aiming to make a statement when a marauding Chennai Super Kings take on a desperate Sunrisers Hyderabad in an IPL encounter on Wednesday. The World Cup snub to Rayudu is the sole disappointment in an otherwise superb tournament so far for Mahendra Singh Dhoni’s men as they are just a win away from clinching the playoff berth. The toss will take place at 7:30. We are 20-odd minutes away from the toss. CSK win toss, opt to bat. MS Dhoni not playing Suresh Raina leads CSK. SRH beat CSK by six wickets. Wicketkeeping: It will be a tricky choice to pick between the two stalwart keepers – MS Dhoni or Jonny Bairstow, as both are known to lit the stage on fire with their batting explouts. But keeping in-form Dhoni in mind, it will be too hard to resist the temptation of including him in your fantasy XI. Also, Dhoni’s ability to guide his bowlers from behind the wicket makes him a valuable asset for the side. Batting: Both Hyderbad and Chennai boast of some of the biggest names of world cricket ranging from – David Warner, Jonny Bairstow, Faf du Plessis, Suresh Raina, Kedar Jadhav, Vijay Shankar. As the Hyderabad track is known to assist the batters a little more – it would be ideal to pick batsmen who can dominate from the word go. Bowling: Keeping the nature of Hyderabad strip in mind, the role of Bhuvneshwar Kumar, Khaleel Ahmed, Deepak Chahar become very crucial for their respective sides. Imran Tahir can be picked up as the sole spinner in the side keeping in mind his recent form. All-Rounder: It’s a tough choice but Ravindra Jadeja seems to be the ideal candidate for this role. Jadeja’s bowling, batting and incredible fielding efforts makes him some choice for this role. MS Dhoni (C/wk), David Warner, Jonny Bairstow, Faf du Plessis, Suresh Raina, Kedar Jadhav, Ravindra Jadeja, Deepak Chahar, Bhuvneshwar Kumar, Khaleel Ahmed and Imran Tahir. Check SRH Dream11 Team Player List / CSK Dream11 Team Player List / Dream11 Guru Tips / Online Cricket Tips and more.